Making your first “real world” apartment your own can be a seriously daunting task. For starters, you have no clue how long you’ll actually live there, you’re on a pretty tight budget, and most likely, you’re pressed for space. Yet you still want you’re first home to really feel like a home. Don’t worry! These tips will help you turn your new space into a place you love calling your own, without breaking the bank. It’s not smart to make big-ticket purchases just yet. You’re in the transient phase—spending too much money on large-budget items could potentially backfire down the road… especially if you’ll be moving in the near future. Make inexpensive purchases that can easily relocate with you on your next move—and if they can’t, reselling them is no big deal. In addition to flea markets and thrift stores, sites like Craigslist, Overstock, Ebay and Etsy are amazing resources for bargain finds. For our NYC friends, check out curatedcraigslist.com for Craigslist’s best home items in your ‘hood. 2. Dual-purposed items are your friend. Desks and tables are not always the least expensive items on the market… but both are pretty similar. If you’re truly pressed for spaced, purchase a dual-purpose surface—something that’s great for both working and eating. A slicker surface, like this simple Ikea piece, is easy to wipe down with a damp cloth (post-meal), while also serving as a great (and unobtrusive) workspace. And it hardly weighs a thing, so it’s so easy to move around! Never underestimate the potential your walls hold. For example, if you’ve got no room (or extra cash) for a nightstand, install a simple wall shelf above your bed. This maximizes space in a decorative fashion. 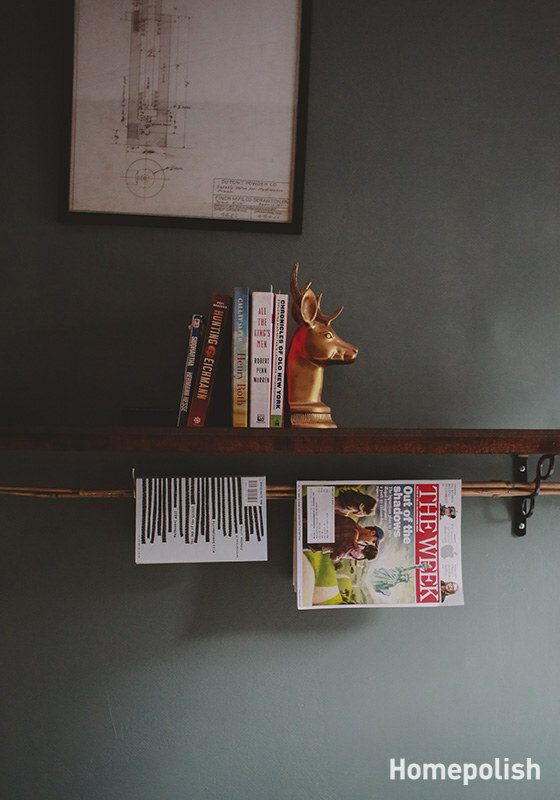 Inserting a dowel rod or stringing a rope between the shelf’s brackets also makes a fantastic magazine rack + bookmark. 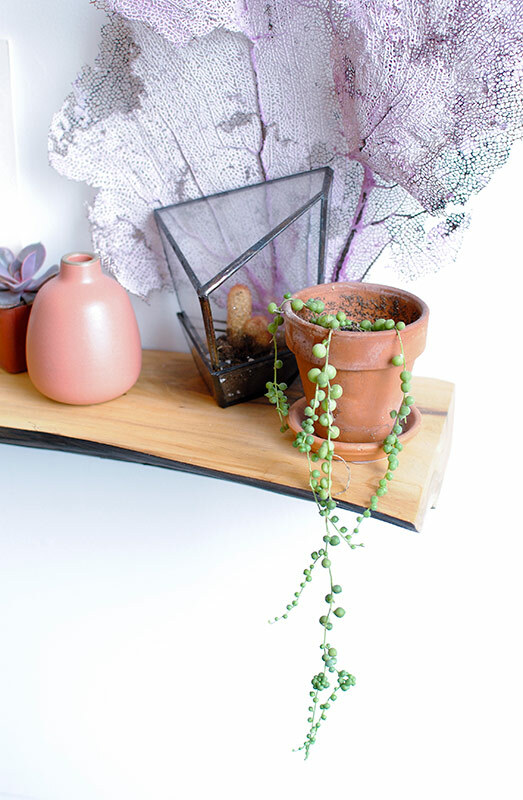 Throw in a nice book-end and/or a droopy plant (I’d recommend string of pearls or burro’s tail), and you’re lookin’ good. You can also use wall shelves as storage space. Choosing baskets like this or this make for a good-looking option, while keeping your things nice and organized. 4. Gallery walls are basically the grown-up version of collages. Framing large pieces of art is expensive. 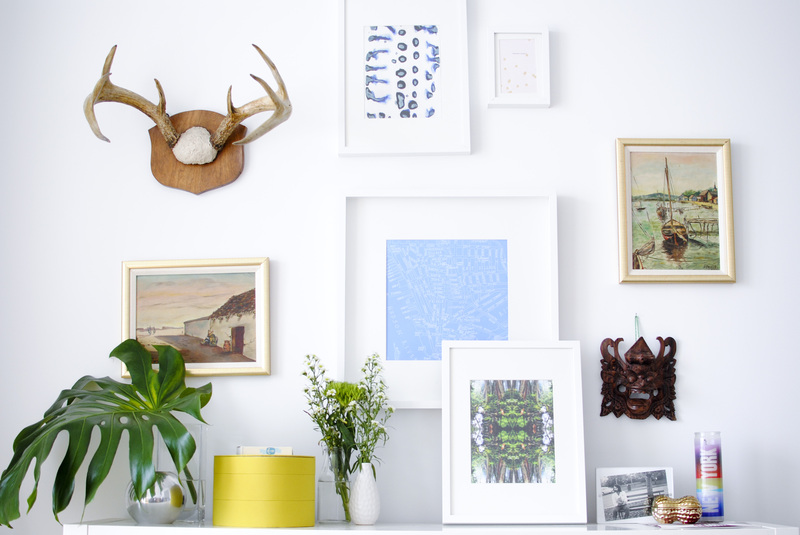 Creating a gallery wall is way less expensive, and way more fun. They’re a great way to mix and match artwork, photographs, wallpaper or fabric samples, and your favorite greeting cards. Ikea sells really cheap frames in an assortment of colors, which you shouldn’t be afraid to mix! Metallic + wood? Black + white? Anything goes. Throw a fun little mirror into the mix if you can—reflective surfaces make your teeny space feel more spacious. To save even more money, pick up colorful washi or artist’s tape from your local craft supply store (apx. $5.99 per roll), and create your own DIY frames. 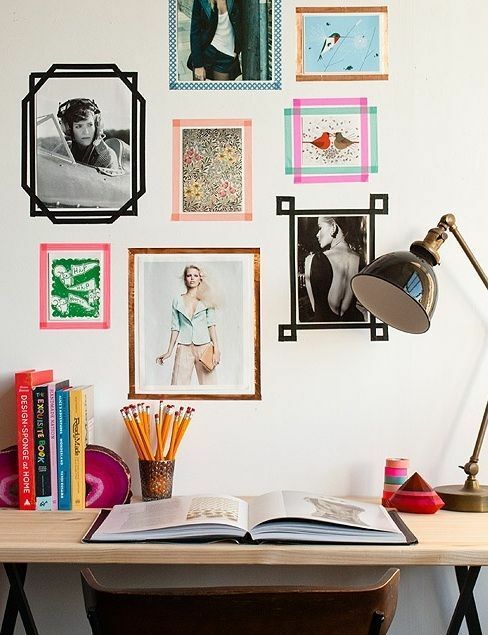 Simple frames (or washi tape frames) arranged in an asymmetrical manner allow you the freedom to add more pieces (and rearrange) down the road. There are few things better than bringing home fresh flowers. They liven and brighten up a space without taking up hardly any room. Sadly, flowers are not forever. Invest the few extra bucks in a succulent or two. 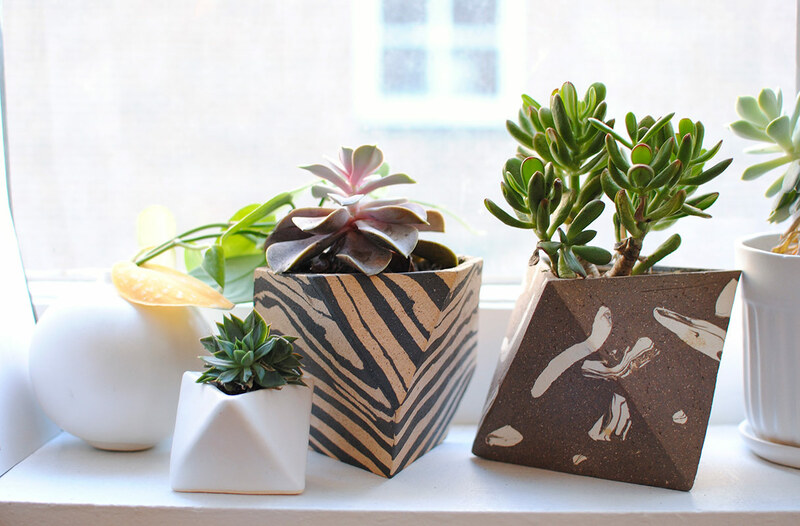 These adorable plants require very little maintenance* and really make a huge difference in your space—they even clear the air of unwanted toxins! They come in varying sizes, and can be found at your local Home Depot, Trader Joe’s, or grocery market. A dash of green really goes a long way—you’ll be surprised at the happiness a little plant can bring! *Succulents should be watered once a week, and can survive in high or low light conditions. Photo by Claire Esparros. Very helpful post! I definitely plan to do a gallery wall in my next apartment now!